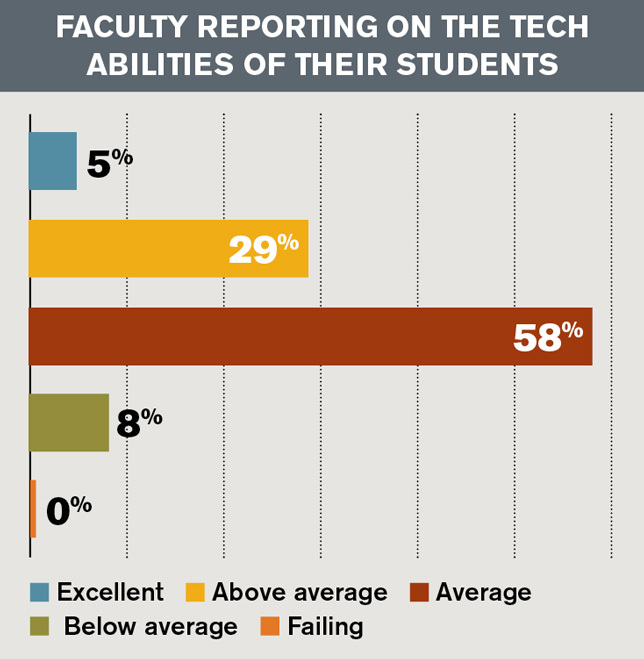 Eight-four percent of faculty in our 2017 Teaching with Technology Survey believe their tech skills are more than adequate for the job, but only 34 percent said their students' skills are "excellent" or "above average." 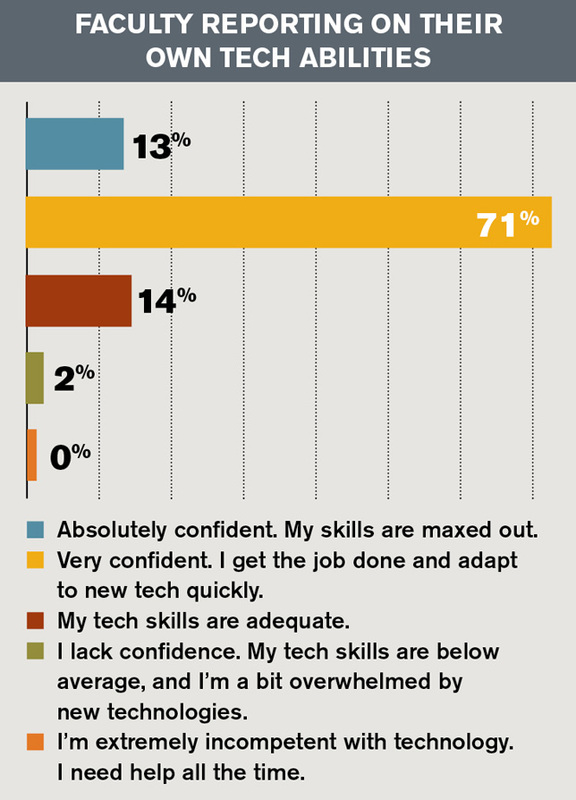 Faculty confidence in their technological abilities is growing. In a nationwide survey on the use of technology for teaching and learning, a full 84 percent of respondents said they are "absolutely confident" or "very confident" in their tech skills (up from 79 percent in 2016), and another 14 percent consider their skills "adequate." Just 2 percent said their tech skills are "below average," and not one person identified as "incompetent." Those findings came out of Campus Technology's second annual Teaching with Technology Survey, in which we asked faculty how they feel about tech in the classroom, where they go for IT support and more. Faculty weren't as rosy about their students' tech abilities, however, which seem to be slipping. This year, 34 percent of faculty said their students' tech skills are "excellent" or "above average," down from 39 percent in 2016. Fifty-eight percent of our respondents consider their students to have "average" tech abilities; 8 percent called their students "below average" in this area. "Students are far less comfortable with technology than the 'digital native' prophets believe," commented one faculty member from North Carolina. 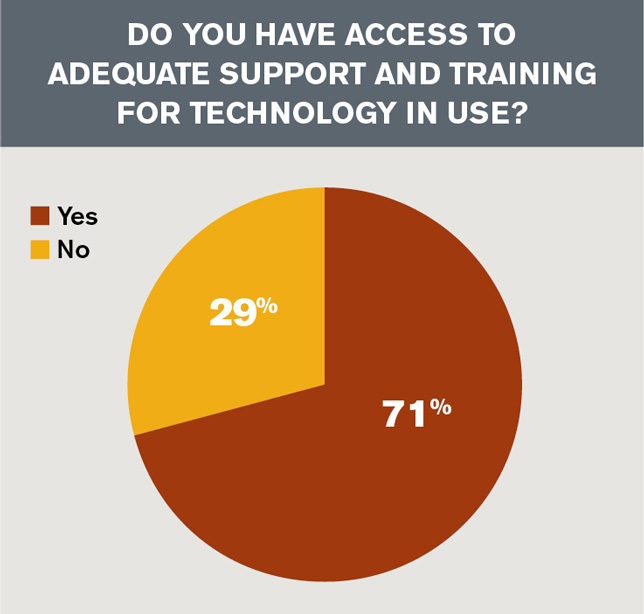 The good news: Seventy-one percent of faculty feel there is plenty of IT support for education technology on campus. While 37 percent like to solve their own problems via online search, 21 percent turn to the help desk or IT department when in need of assistance. 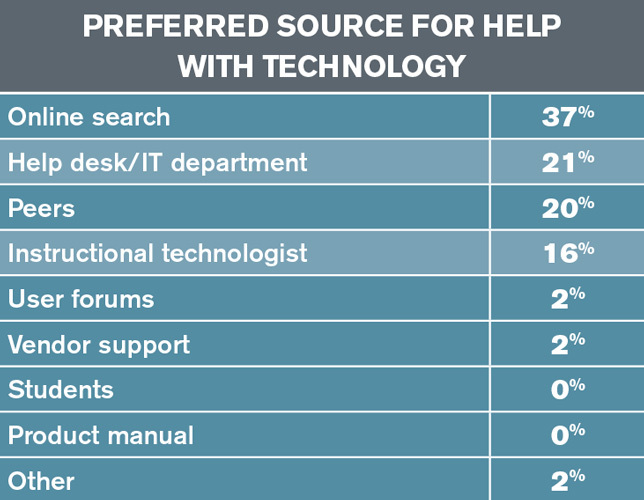 Peers and instructional technologists are also preferred sources of help, cited by 20 percent and 16 percent of respondents respectively. That's not to say faculty don't have gripes, particularly when it comes to new technologies or innovations. "I think the most problematic part of technology in education is the all-too-common practice of buying some new technology and then not having the expertise to train the faculty how to use it," said one respondent in Missouri. "Most faculty are not comfortable failing in front of the class." "There is little to no support for innovators from IT departments (that tend to squelch innovation because it is hard to support)," complained a faculty member from New York. And as one Florida respondent put it succinctly: "Support and training are barriers." The full results of the Teaching with Technology Survey appear in the July digital issue of Campus Technology. Highlights from the survey will also be posted on this site over the coming months. You can check back for ongoing coverage in our Research section. Our survey polled 232 faculty members across the country about their use of technology in the classroom, their likes and dislikes, their predictions for the future and more. The majority of respondents (68 percent) come from public institutions, with 28 percent from private nonprofits and 4 percent working at for-profit schools. Seventy-two percent work at four-year colleges or universities; 26 percent are at community colleges (the remaining 2 percent designated their institutional level as "other").